The Queen and the Duke of Edinburgh, accompanied by other members of the Royal Family, attended the Royal British Legion Festival of Remembrance at the Royal Albert Hall, London. Ahead of the Festival, they reviewed the South Steps of the venue, which were renamed the Queen Elizabeth II Diamond Jubilee Steps. 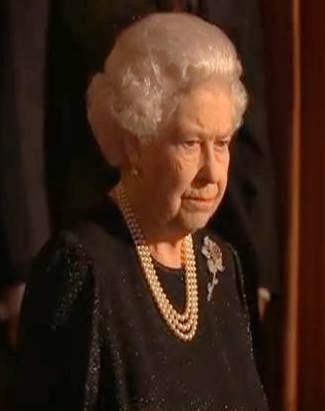 The Queen's pulled out one of the larger brooches I wish we saw more often, the Williamson Diamond Brooch with its spectacular pink diamond center. But interestingly, she wore no red poppies with it - unusual, as we've just seen in our flashback. She also wore one of her longer triple strands of pearls (a few glimpses of the clasp, above). And she wore a few diamond rings, though it's hard to tell which ones, and what I think is her usual gold watch. Several other members of the family were in attendance along with HM and the DoE: The Earl and Countess of Wessex, the Duke of Kent, Princess Alexandra of Kent, Prince and Princess Michael of Kent, the Princess Royal, Vice Admiral Sir Tim Laurence, and the Duke and Duchess of Gloucester (you can just see the Duchess peeking out from behind Tim Laurence, below). I noticed the Princess Royal was wearing her own diamond star brooch - sometimes confused with the Jardine Star Brooch, but no, just another example of how popular that motif has been over the years. For a gallery from the event, click here.